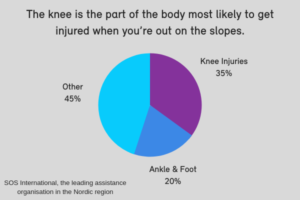 According to SOS International, the leading assistance organisation in the Nordic region, the knee is the part of the body most likely to get injured when you’re out on the slopes. Lower leg injuries account for 55% of the injuries SOS International deal with and, of these, knee injuries are by far the most common (35%). Lower leg, ankle and foot injuries account for around 20% of injuries. The organisation treats more men than women (56% compared to 44%) and injuries are highest among the 41-50 year age group. Winter sports come with a high risk of injury as they involve strenuous exercise in sub zero temperatures. Your muscles may be unaccustomed to exercising in this way and the cold temperatures put your muscles, joints and ligaments under additional strain. There is a high risk of falls or collisions, as well as abrupt changes of direction. Taking some simple precautions can reduce your risk of getting injured. The number one tip is to warm up thoroughly before heading out onto the slope. Read our blog on why this is important [Link to other December blog]. Equally important is to stop when you get tired. Pushing tired muscles to keep working in low temperatures is a leading cause of injury. Another is using equipment incorrectly or faulty equipment. It is important to wear the right protective gear and to make sure you are wearing it correctly. Modern ski boots with a high, rigid shell have helped to decrease ankle fractures by 91%, as well as knee injuries. If in doubt, ask one of the instructors to help you. Always listen to advice from people who know the area and don’t try to do more than you are capable of. Not every injury is avoidable unfortunately. Injuries can occur as a result of landing badly after a jump, collisions, sudden changes of direction or falls. Medial collateral ligament injury – These account for up to a quarter of all skiing injuries, particularly among beginners and intermediate skiers. They can occur as a result of falling or catching the edge of the ski resulting in a partial or completely torn ligament or damage to the edema around the ligament. Treatment usually involves wearing a hinged knee brace but some injuries may require surgery. Anterior cruciate ligament injury – Between 13 and 19% of all skiing injuries involve damage to this ligament, causing the knee to become unstable and lose its full range of movement. Injuries can occur when there is a twisting force to the knee. Treatment may include wearing a functional knee brace, physiotherapy and surgery. Skier’s thumb – This is the most common upper limb injury in skiing, accounting for up to 17% of all ski injuries. It usually results from a fall and results in pain, swelling and a tender lump on the thumb joint. It may require surgery. Shoulder injuries – These can occur as a result of skiing and snowboarding. Possible injuries include fracture, dislocation and rotator cuff injuries. Other common injuries include ruptured Achilles tendons, sprained ankles and lower back pain. While taking precautions to avoid injury is sensible, not every type of injury can be avoided, unfortunately. If you do become injured while participating in winter sports, it is important to stop and seek medical advice. Failure to do so could result is worse damage which may entail a lengthy recovery period.